When John Sughrue set out to start the Dallas Art Fair, it was for a simple reason: He and co-founder Chris Byrne “selfishly wanted to attend an art fair in Dallas,” he told crowds at the opening of the fair’s ninth edition on April 6. What they weren’t sure about was who else would share that desire. Fast-forward nearly 10 years later, and the Dallas Art Fair is welcoming 95 galleries, over 30 of whom are first-time exhibitors, to the Fashion Industry Gallery (F.I.G.). The collectors looking to buy are mainly in-state, but thanks to a locus of world-class institutions—the Dallas Museum of Art (DMA), the Nasher Sculpture Center, and the Dallas Contemporary—and major private collections, Dallas has become an important stop on the global fair circuit for international collectors looking to tap its emerging market. “I don’t know if y’all heard, but big things happen here,” said Mayor Pro Tem Monica R. Alonzo at the pre-opening press conference, stressing the city’s commitment to the arts and its desire to be known for more than its beloved Cowboys football team (which, if you’re wondering, has an art collection of its own). There are dealers from Latin America, from Paris, London, Berlin, Brussels, Spain, and Italy, and even from Dubai and Asia. In addition to a strong contingent of local exhibitors, US galleries hail from everywhere from New York, Los Angeles, and San Francisco to Chicago, Milwaukee, and Detroit. “Some of the most important collections in the US are here in Dallas, so it’s important for us to have a presence here,” said Ana Michelon, director of New York’s Albertz Benda, of the gallery’s decision to join the fair for 2017. Illustrating her point is the first-time presence of mega-dealer Gagosian, located right by the entrance, though you’d be forgiven for missing them, as the booth signage only mentions the artist, Piero Golia. The booth revisits Golia’s 2015–16 “Chalet” show at the Nasher, repurposing the “That’s All Folks” curtain, itself a Looney Tunes reference, that fell to mark the end of the exhibition/performance, as a series of paintings. Also new to Dallas and prominently located was Lehman Maupin, of New York and Hong Kong, who sold a massive portrait of Joan Didion by Juergen Teller and Tracey Emin‘s neon Just Let Me Love You on opening day. Lisa Carlson, senior director of New York’s Jane Lombard Gallery, told artnet News that the gallery had been “worried” about securing buyers in a new city, but had already sold three different-colored versions of James Clary’s neon sculpture Wheeeeeeeeeeeee! for $10,000. 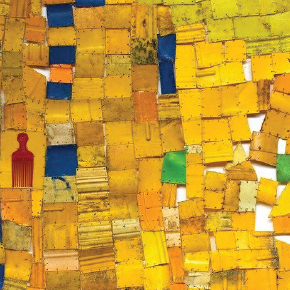 Other offerings included Serge Attukwei Clottey’s tapestry-like “Afro-Gallonism” works, made from repurposed oil cans used for water gathering, at $15,000 and $16,000. On the second floor, Detroit’s Reyes Projects had already sold 90 percent of its booth as the day neared its end—even though the gallery, led by former Marlborough director Terese Reyes, doesn’t open until later this month. It was one of the fair’s more unusual presentations, with an array of Jonathan Rajewski’s creepy $4,500 wind-chime sculptures, featuring grotesque found plastic piggy banks of Elmo, hanging from the ceiling. Fellow first-timer Skarstedt, of New York and London, did advance scouting ahead of the fair, visiting the city two months ago to start building local connections. The groundwork paid off, as the gallery was one of six dealers who sold work—by Justin Adian—to the DMA as part of the fair and museum’s acquisition partnership, now in its second year. Some of the other galleries having their Dallas debut have actually never shown at a US fair before, like Milan’s Luca Tommasi Arte Contemporanea. The young gallery was showing work by Giorgio Griffa, an Italian artist who was on the fringes of the Arte Povera movement, and is just now, at 80, beginning to get institutional recognition. The gallery decided to cross the Atlantic in part because the DMA purchased one of Griffa’s works at the 2016 fair, and had sold one $15,000 piece by the end of the opening gala. Recent or upcoming area museum exhibitions were frequently cited as reason for a gallery’s offerings, such as Enoc Perez’s architectural paintings, many of which feature Dallas landmarks, at New York’s Peter Blum Gallery—they are coming to the Dallas Contemporary in 2018. Nancy Whitenack of Dallas’s Conduit Gallery has shown with the fair for eight of its nine years, and has seen dramatic change in that time. Whitenack believes the fair will soon reach a tipping point where it will become more than just a regional destination, drawing in collectors from the national art scene. Asmaa Al-Shabibi of Dubai’s Lawrie Shabibi agreed, telling artnet News that “people are quite committed and excited about this fair in a way maybe they’re not in a place like New York.” The gallery was back for a second go-around after the DMA bought one of their works by Nadia Kaabi-Linke in 2016. Amid such global offerings, the locals held their own. Dallas’s Ro2 Art Impressed with a riotously colorful salon style hang, featuring everything from a massive Terry Hays painting in glossy segments on Sintra (compressed PVC board) for $25,000 to a series of tiny layered paper cuts in ornate frames by Charles Clary for just $150–350. The gallery has a focus on Texas artists, but “you’re not going to see a lot of cowboys or anything like that,” owner Jordan Roth told artnet News. “It’s a big deal for us,” he said of showing at the fair. Roth had taken advantage to his booth’s proximity to the bathroom to send a subtle political message with Alexander Paulus’s Sometimes a Woman Isn’t a Woman ($2,500). “Texas is considering a bathroom bill where they will check birth certificates or something,” he explained, expressing his hope that people will notice the work’s strategic placement. Texas’s longstanding status as a red state didn’t keep dealers from bringing political work with a liberal bent. At Conduit, there were Sarah Ball’s paintings of archival photos of immigrants entering Ellis Island ($3,000–4,000). Immigration was also the theme of Pietro Ruffo’s intricate ballpoint pen drawings, mounted on canvas and cut into sections, birds pinned to fly over scenes of migrants being prevented from entering a foreign country. The impressive works ranged from $11,000–30,000 at Paris’s Galerie Italienne. For Stefan Lundgren, a Swede who shows New York and Los Angeles-based artists at Lundrgen Gallery in Palma de Mallorca, Spain, there’s no point in tailoring offerings to a specific audience. “We only show what we collect,” he told artnet News. The gallery had one of the fair’s few video works ($14,000), set against a bold wall covered in futuristic-looking wallpaper ($15,000 for the one-of-a-kind piece). Both were by Jacolby Satterwhite, who had an exhibition at the DMA in 2015. “They told us it’s all about painting in Dallas, and so we said let’s bring some video paintings,” said Tim Wouters of Brussel’s Waldburger Wouters, showing swirling, organic-looking video motifs by Jakub Nepraš ($9,000–19,500). He allowed the crowd might be slightly less-knowledgeable than one in New York or London about how to install such work, but cited visitor’s enthusiasm and curiosity. “I think it would be a pity to bring only paintings,” he added.